Manufactured by: Berkeley Nucleonics Corp. The Model 8010 is an inexpensive general purpose pulse generator with a broad operating range. Its two outputs provide for the maximum in output waveform flexibility. For example, one may have TTL and ECL levels simultaneously. The internal clock rates, 1 Hz to 50 MHz, together with external trigger, single cycle, and synchronous and asynchronous gating gives the user a very broad range of pulse train control. 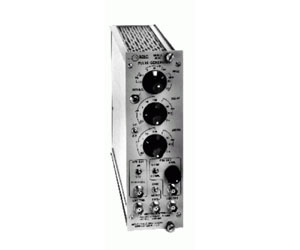 The Model 8010 is packaged in an AEC NIM module, a convenient standard in the non-nuclear as well as nuclear field. The compact size of the module (the front panel is only 2.7" x 8.7") permits independent use or easy interconnection of multiple pulsers in a system.